Ed’s a new friend, who has earned his stripes. I haven’t read his book, but I love the man’s heart. 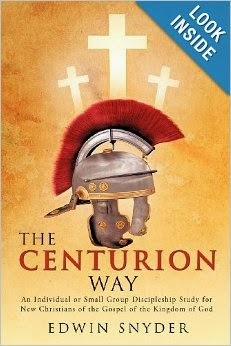 The Centurion Way was written so that it could be utilized as a discipleship study by either an individual or small group. It is written in a conversational tone, as if you were sitting at a kitchen table having a cup of coffee and conversation with the author. A central theme that is woven throughout this study is the Gospel of the Kingdom of God and the significance of that to our faith. The author discusses a number of topics relevant to Christians today and has provided extensive Scripture references for further study and discussion. In many ways, this is a back to the basics study that is intended to get people to reflect and evaluate their relationship with God, their family, and the Body of Christ. It also emphasizes that obedience to God and walking in His ways is the path to personal healing and wholeness. Jesus came as the Messiah to declare, and perform, the Gospel and He is still doing it today.